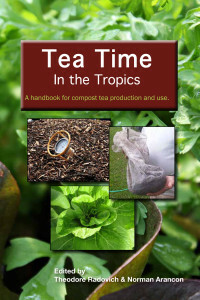 Tea Time in the Tropics: A Handbook for Compost Tea Production and Use explores compost tea from the perspective of growers, researchers and industry. 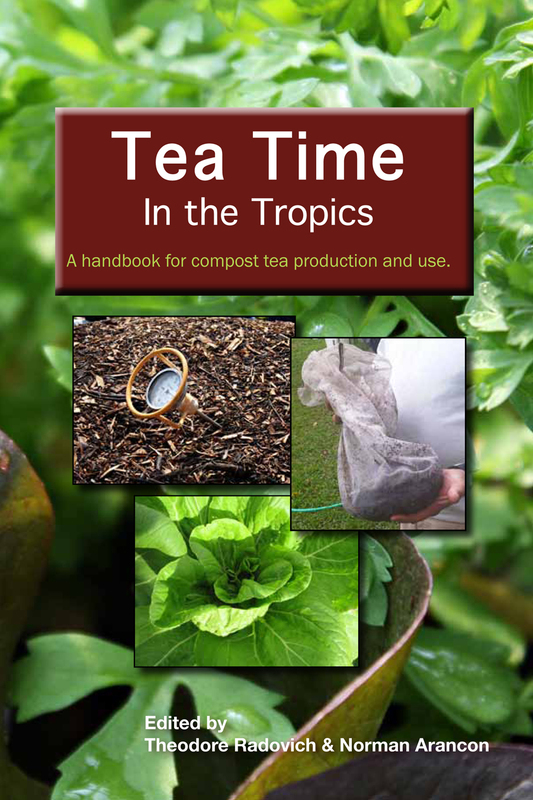 The free downloadable handbook was produced as an output of a Western Sustainable Agriculture Research and Education (SARE) grant project entitled Enhancing Phytonutrient Content, Yield and Quality of Vegetables with Compost Tea in the Tropics. Growing Solutions’ founder and CEO Michael Alms was a project participant and co-author of the handbook. The publication is co-edited by Theodore Radovich, PhD and Norman Arancon, PhD. Radovich, a longtime proponent of compost tea, is Assistant Extension Specialist in the Sustainable and Organic Farming Systems Laboratory at the University of Hawaii at Manoa, College of Tropical Agriculture and Human Resources (CTAHR). Arancon is Assistant Professor of Horticulture in the College of Agriculture, Forestry & Natural Resource Management at the University of Hawaii in Hilo. Dr. Arancon is a pioneer in researching the use of vermicomposts to increase the growth, flowering and yields of plants such as marigolds, petunias, bell peppers, tomatoes, strawberries and grapes. His research has also revealed that vermicompost teas can potentially have the same effects on plant growth and the suppression of pests and diseases. Quantify the independent and interactive effects of compost quality extraction method and crop management on yield and phytonutrient content of model root, fruit and leaf vegetables. Determine, at the whole-farm level, the effect of compost tea applications on yield, phytonutrient content, and profitability with commercial vegetable operations on three islands in Hawai’i. Build and enhance the capacity of at least 300 growers to effectively employ compost tea to increase vegetable yield and phytonutrient content on their farms. The project team cited as a basis of its pursuits a poor understanding of the interactions between compost type, crop, and environmental factors as they relate to plant yield and quality, particularly under tropical conditions. This lack of understanding restricts widespread adoption of compost tea technology to conventional farms that want to improve the sustainability of their operations. The project was made available with support from the SARE program and funded by the U.S. Department of Agriculture-National Institute of Food and Agriculture. Use of vermicomposts, produced through interactions between earthworms and microorganisms, promote the germination growth, flowering and yields of a range of greenhouse and field horticultural crops, including tomatoes, peppers, strawberries, raspberries, grapes, marigolds and petunias. Vermicompost use has become a well-established practice over the last 10 years, in part due to the work of scientists at The Ohio State University.